Human rights advocacy groups have long called for international efforts to stop genocide and crimes against humanity which they claim are being systematically carried out by North Korean authorities. The communist country has been accused of human rights abuses for decades, ranging from holding hundreds of thousands of political prisoners to torture and public executions. Pyongyang has flatly denied the accusations, calling them a U.S.-led attempt to topple its regime. “Every act defined as a crime against humanity is being committed on a systematic level in North Korea’s concentration camps today,” Robert Park, a Korean-American Christian missionary, told the crowd in front of Seoul Station at the center of the capital. Park was tortured in North Korea during 43 days in detention for illegal entry in late 2009. 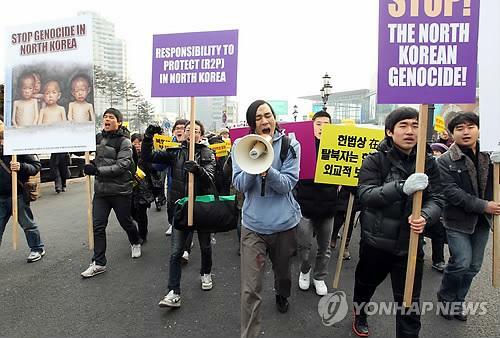 A crowd estimated by police at about 150 chanted “stop the genocide” as they marched a few kilometers on the sidewalk toward the Chinese Consulate to call on Beijing not to repatriate North Korean refugees back to their homeland. Still, they were later stopped by dozens of police wearing florescent yellow jackets near the Chinese diplomatic mission. No clash occurred as they later peacefully dispersed. China does not recognize North Korean refugees and sends them back to the North, where they face harsh punishments and even execution, according to defectors and activists. Organizers said similar rallies were held or are scheduled to be held in Berlin, New York, London, Tokyo, Hong Kong and Jakarta in coordinated efforts to put pressure on the North to end its dire human rights situation. The latest move comes as North Korea’s new leader Kim Jong-un appears to be consolidating the power he inherited upon the death last month of his father, former North Korean leader Kim Jong-il. 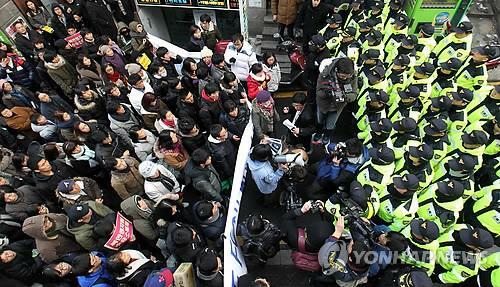 Tuvia Israeli, Israeli Ambassador to South Korea, said he believed that protest rallies may put pressure on the North over its dire human rights record, though he said Pyongyang is unlikely to change unless it feels the heat of the international community. This entry was posted in In the News and tagged 67th anniversary, abuse, activists, auschwitz, china, chinese consulate, defectors, holocaust, human rights, human rights abuses, north korea, north korean defectors, rally, robert park, seoul, south korea, Yonhap News by MOUonekorea. Bookmark the permalink.